Chicago Lawyer Magazine published this piece in print in July 2018. Since the project’s initial training in April — a “soft launch” a month before the official opening — more than 130 lawyers have received training in the many options available to families, including how to set up a power of attorney, legal guardianship and a treatment preference declaration. Samira Nazem, director of Pro Bono & Court Advocacy for The Chicago Bar Foundation, said the program has a “limited scope, but high impact” on families trying to secure legal assistance for a loved one at each stage of their case. The program is also headed by Tom Wendt, legal director with the Center for Disability & Elder Law. His organization vets potential clients and provides malpractice insurance to volunteers. 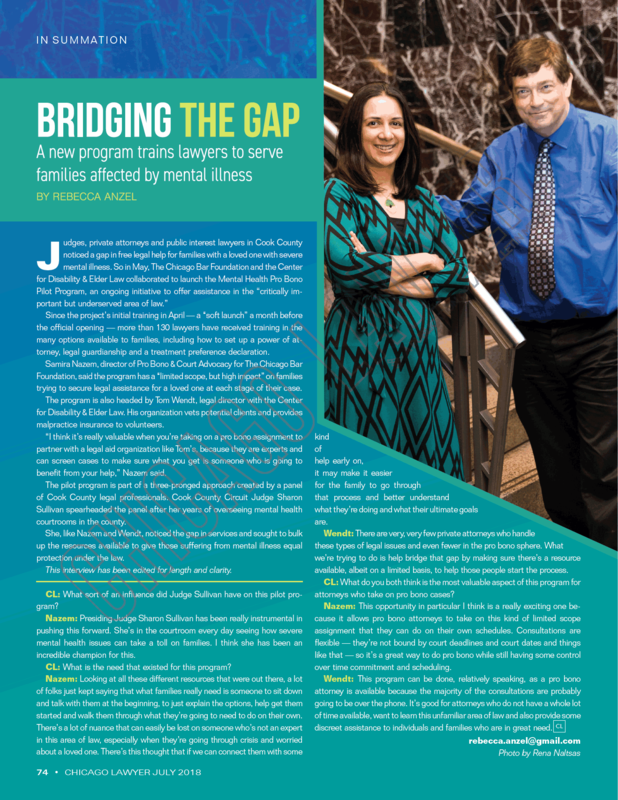 “I think it’s really valuable when you’re taking on a pro bono assignment to partner with a legal aid organization like Tom’s, because they are experts and can screen cases to make sure what you get is someone who is going to benefit from your help,” Nazem said. The pilot program is part of a three-pronged approach created by a panel of Cook County legal professionals. Cook County Circuit Judge Sharon Sullivan spearheaded the panel after her years of overseeing mental health courtrooms in the county. 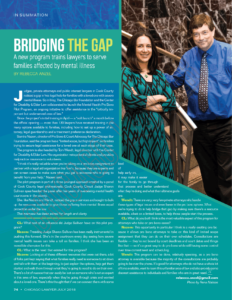 She, like Nazem and Wendt, noticed the gap in services and sought to bulk up the resources available to give those suffering from mental illness equal protection under the law. Chicago Lawyer: What sort of an influence did Judge Sullivan have on this pilot program? Nazem: Presiding Judge Sharon Sullivan has been really instrumental in pushing this forward. She’s in the courtroom every day seeing how severe mental health issues can take a toll on families. I think she has been an incredible champion for this. CL: What is the need that existed for this program? Nazem: Looking at all these different resources that were out there, a lot of folks just kept saying that what families really need is someone to sit down and talk with them at the beginning, to just explain the options, help get them started and walk them through what they’re going to need to do on their own. There’s a lot of nuance that can easily be lost on someone who’s not an expert in this area of law, especially when they’re going through crisis and worried about a loved one. There’s this thought that if we can connect them with some kind of help early on, it may make it easier for the family to go through that process and better understand what they’re doing and what their ultimate goals are. Wendt: There are very, very few private attorneys who handle these types of legal issues and even fewer in the pro bono sphere. What we’re trying to do is help bridge that gap by making sure there’s a resource available, albeit on a limited basis, to help those people start the process. CL: What do you both think is the most valuable aspect of this program for attorneys who take on pro bono cases? Nazem: This opportunity in particular I think is a really exciting one because it allows pro bono attorneys to take on this kind of limited scope assignment that they can do on their own schedules. Consultations are flexible — they’re not bound by court deadlines and court dates and things like that — so it’s a great way to do pro bono while still having some control over time commitment and scheduling. Wendt: This program can be done, relatively speaking, as a pro bono attorney is available because the majority of the consultations are probably going to be over the phone. It’s good for attorneys who do not have a whole lot of time available, want to learn this unfamiliar area of law and also provide some discreet assistance to individuals and families who are in great need.